1.Which of the following statements about the kidney is false? A) The renal pelvis drains into the ureter. B) The renal pyramids are in the medulla. C) The cortex covers the capsule. D) Nephrons are in the renal cortex. 2. 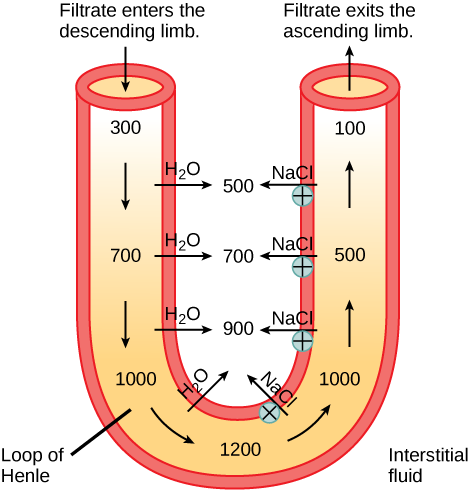 Which of the following statements about the nephron is false? A) The collecting duct empties into the distal convoluted tubule. B) The Bowman’s capsule surrounds the glomerulus. C) The loop of Henle is between the proximal and distal convoluted tubules. D) The loop of Henle empties into the distal convoluted tubule. A) present in the renal medulla. B) dense tissue present in the outer layer of the kidney. C) cells present in the DCT and collecting tubules. D) present in blood capillaries. 4. The osmolarity of body fluids is maintained at ________. 5. The gland located at the top of the kidney is the ________ gland. 6. 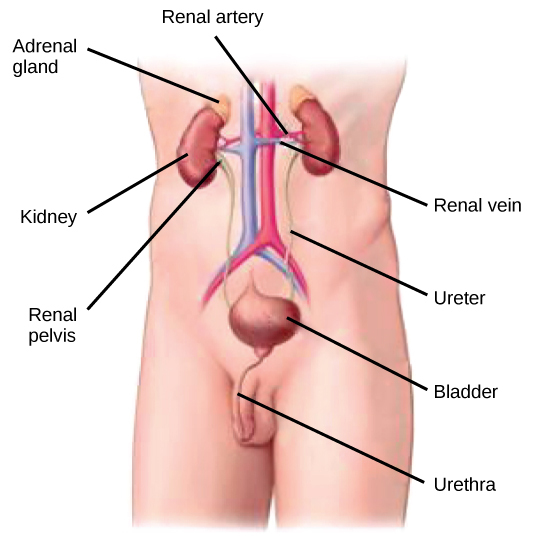 Loop diuretics are drugs sometimes used to treat hypertension. These drugs inhibit the reabsorption of Na+ and Cl– ions by the ascending limb of the loop of Henle. A side effect is that they increase urination. Why do you think this is the case? 7. 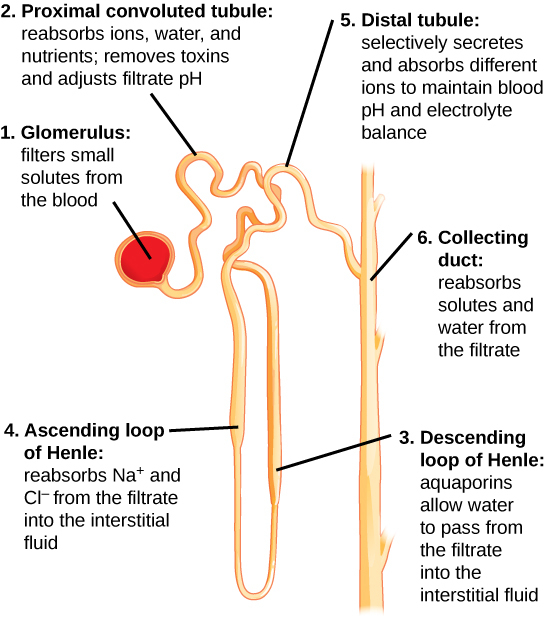 Why are the loop of Henle and vasa recta important for the formation of concentrated urine? 8. 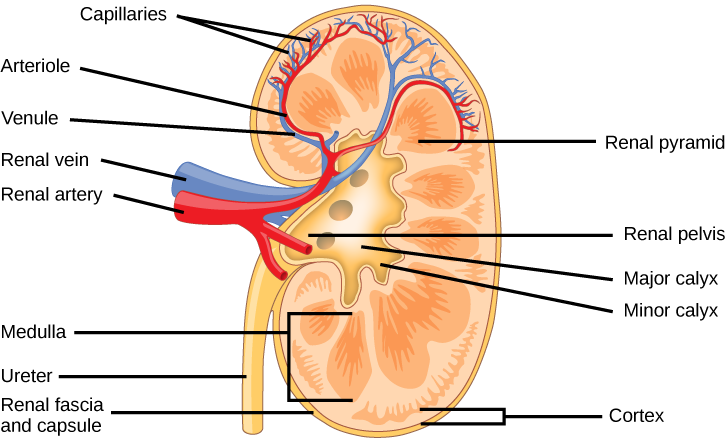 Describe the structure of the kidney. 22.2. The Kidneys and Osmoregulatory Organs Copyright © by laesoph. All Rights Reserved.